Found one file extension association related to Corel Trace and 1 file format developed specifically for use with Corel Trace. As part of Corel DESIGNER Technical Suite, Corel Trace handles the complex task of converting bitmap images into perfect vector drawing for further processing. 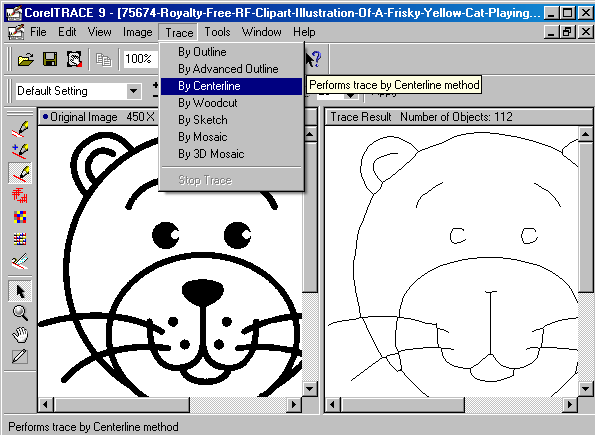 Now all old drawings and even images can be scanned in and put through Corel Trace to produce vector drawing that can be edited and used by other products of the Technical suite. The Corel Trace software seems to be old or discontinued. If you need more information please contact the developers of Corel Trace (Corel Corporation), or check out their product website.